When the soccer season began in earnest, La Salle High School had one goal in mind, and it was a doozy. Repeat as Catholic League champions. On Monday night, Oct. 30 at Northeast High School, the Explorers reached yet another pinnacle. When their 1-0 victory over rugged Roman Catholic was over and the players raced toward each other near centerfield, it was part euphoria, part relief. That’s putting it mildly. La Salle’s lone blemish during the Catholic League regular season was a 1-1 tie with Lansdale Catholic. Among La Salle’s victories was a 3-0 decision over Roman Catholic – the Cahillites’ only league non-victory – on Sept. 29. There was no way, however, that the championship would be decided by such a wide margin. Sure enough, after a very chippy first half that actually paled in comparison to the final 40 minutes, La Salle senior Jacob Mittman scored from deep inside Roman territory with 9:29 remaining in regulation. Asked later to describe the most important tally of his career, Mittman needed to summon a couple of nearby teammates to piece together all that occurred leading up to the ball falling behind Roman’s outstanding sophomore goaltender, Kevin Tobin. The game was really that close. In winning their ninth league title in their 13th final, the Explorers (17-1-2) became the first repeat champion since, ironically, La Salle captured titles in 2011 and 2012. Before that, the last back-to-back champ was … La Salle, in 2005-2006. And before that? La Salle from 1993 to 1994. 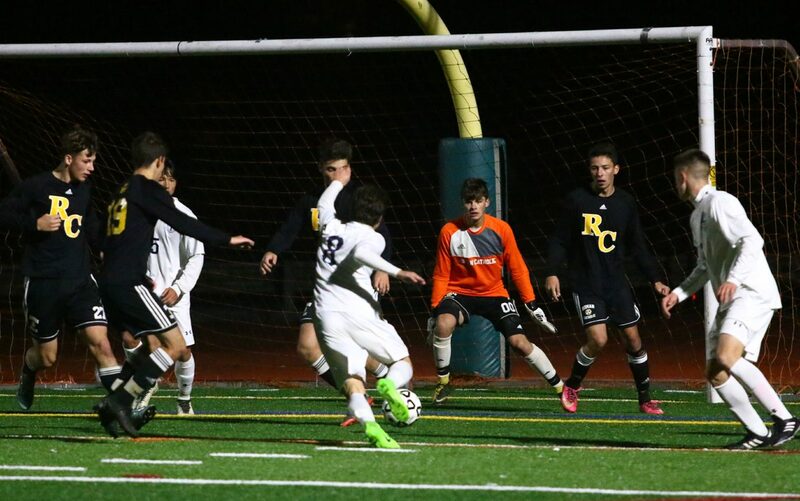 Roman Catholic, which won the league title in 2015, was playing in its fourth consecutive championship. A squad loaded with underclassmen, the Cahillites (15-6) are primed to return to the finals next year. “First off, congratulations to Tommy and his team on a great season,” said 11th-year coach Ray DeStephanis. “As for us, I’m proud of our boys. They gave the effort and played the match they needed to in order to win the game. If we drop one in early, maybe we are singing a different tune right now. As the state tournament approaches on Tuesday, the Explorers are hoping to have more success than last year, when they were ousted in the first round.